The worst third quarter for the stock market in four years has been followed by the best month for stocks in four years. You could have thrown a dart at a stock table (Remember stock tables? Remember newspapers?) at the beginning of October and the stock that it landed on probably went up this month. By a lot. 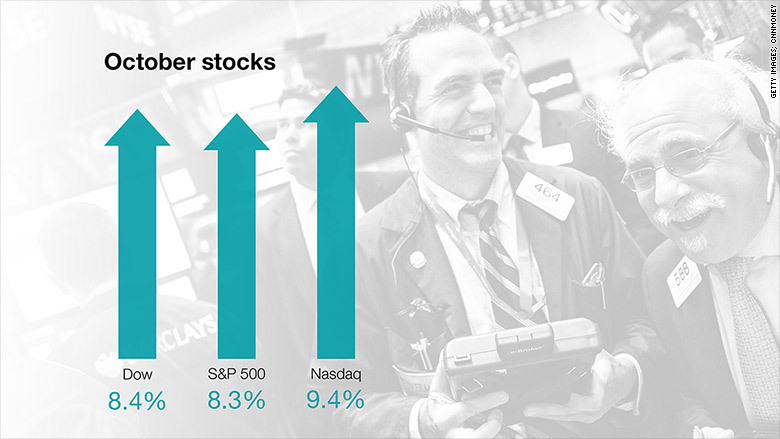 The Dow and S&P 500 have soared 9% in October. Less than 20% of the companies in the S&P 1500 (a mix of large, mid-sized and small stocks) have lost ground during the month. But here's a potentially troublesome sign. A big chunk of the market's laggards in October were consumer companies. Retailers Walmart (WMT), Nordstrom (JWN), Gap (GPS) and Best Buy (BBY) have all missed out on the October rally. So have restaurant chains Chipotle (CMG), Yum Brands (YUM), Dunkin' Brands (DNKN) and Buffalo Wild Wings (BWLD). Many of these companies reported sluggish quarterly results this month and some also issued cautious outlooks for the remainder of the year. Giant drugstore chain CVS (CVS) issued tepid guidance on Friday this morning too, sending its stock down 6%. Same-store sales at the front end of its stores (i.e. not prescription medications) were down 5.8% from a year ago. A big reason for that was the fact that CVS no longer sells cigarettes and other tobacco products. But even if you exclude last year's tobacco sales, CVS still would have reported a nearly 1% drop at the front end. Why? CVS cited "softer customer traffic." So is the consumer pulling back at precisely the wrong time? The holidays are right around the corner after all. Buffalo Wild Wings CEO Sally Smith told me Thursday that the company had fewer customers in October than it expected and that this was happening across the restaurant industry. "We're seeing some consumer weakness," she said. That's not good news. If there were ever a time for Buffalo Wild Wings to be doing well, it's now. It's a sports bar chain for crying out loud and we're in the middle of football (pro and college) season as well as the baseball playoffs. Shares of other casual dining chains have slumped in October too, including Ruby Tuesday (RT), Applebee's owner DineEquity (DIN), Cheesecake Factory (CAKE) and Chili's parent company Brinker (EAT). We've heard all year that people have been going out to eat and drink more. Lower gas prices apparently encouraged people to get in the car more often and splurge on a meal. Of course, it's not all doom and gloom for consumers. 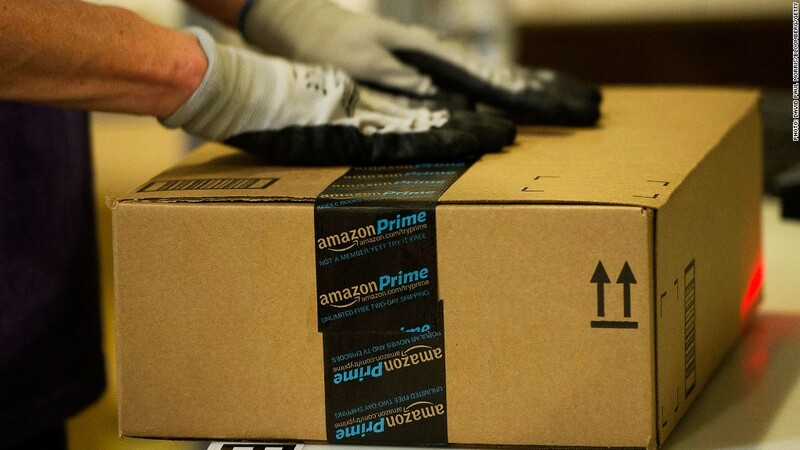 Amazon (AMZN), McDonald's (MCD), GM (GM) and Mattel (MAT) have all outperformed the market this month. So have two companies named Sonic -- drive-in hamburger chain Sonic (SONC) and car dealer Sonic Automotive (SAH). But consumers appear to have suddenly become more frugal. Perhaps with good reason. The government reported Friday that personal spending and income were only up 0.1% in September. Wages actually fell. If this trend continues, then the fourth quarter could turn out to be a rough one for consumers and maybe Wall Street. The market has soared despite the pullback in retailers. But it may be hard to have the proverbial, end-of-year Santa Claus rally without healthy gains in consumer spending. Spoiler alert. There is no Santa Claus. And consumers behaved more like the Grinch than Kris Kringle in the third quarter and October.